Hale Paia, or “Paia House”, is a three bedroom, two bath home in Paia Town on Maui’s North shore. So, you can walk into town or to the beach in minutes. Plus, the famous beaches of Ho’okipa, Lanes, Mama’s Fish House, Tavares, Paia Bay, and Baldwin Beach range between a five minute walk and a five minute drive. The north shore has no high rise buildings and is the antithesis of the 'resort' experience. Rather, here locals and visitors intermingle, the waves are world-class, and there's plenty of open space. Paia has galleries, restaurants, funky shopping and a wonderful natural foods grocery store called Mana Foods. It's a pretty laid back place. This house is located in a neighborhood. There's a peek-a-boo view to the ocean. The walk to Paia town is about four minutes. It's on the mauka (mountain side) of Hana Highway, but it's far enough away from the road you can't hear the cars. There are neighborhood sounds: people, children, dogs, and a school bus that comes through during the school year. Also, as is very Hawaiian style, the washer/dryer is outside. This keeps the heat outside too. And, if you prefer to dry things in the sun, there's a clothesline. Rooms are not huge, but there's plenty of space and a ceiling fan in each. There is no house phone. This is a well appointed plantation-style home that's perfectly situated for a relaxing north shore vacation. 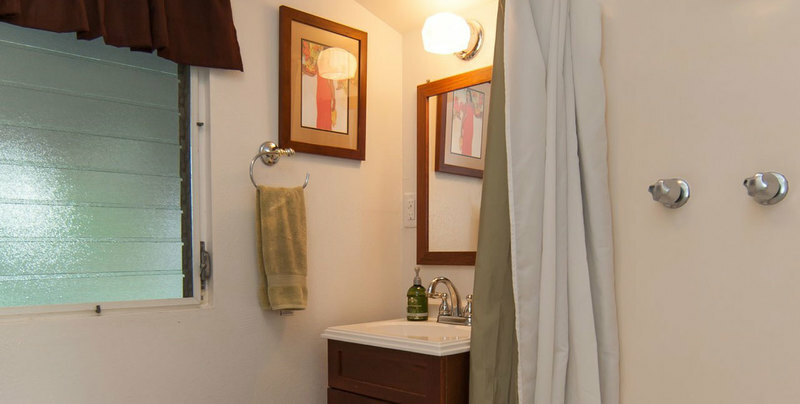 No Smoking, No Pets, Cable TV, DVD Player, High-speed WIFI, Beach Towels, Bath Towels,Linens Included, Private Yard, Lanai, Outdoor Table, Outdoor Chairs, Washer & Dryer, Full Kitchen, BBQ, Parking, Stairs, Kid-Friendly.